In light of National Childhood Obesity Awareness Month this September, Livliga®, a patented line of portion control dinnerware, will be collaborating with two stellar hospitals—Children’s Mercy Kansas City in Missouri and Children’s Hospital Colorado to help bring awareness to the growing obesity epidemic which affects approximately 12.7 million children in the United States. Livliga’s® children’s brand, Kidliga, is launching a “1 for 1” campaign to help kids live healthy. Each time someone buys a Livliga product during September, a set of Kidliga will be donated to children participating in a weight management program either at the Center for Children’s Healthy Lifestyles & Nutrition (CCHLN) at Children’s Mercy Kansas City or Children’s Hospital Colorado. Through the collaboration, Livliga, will also provide unique news and information surrounding healthy eating for families including a new e-book, recipes, cooking demonstrations and giveaways, all in support of the fight against childhood obesity. 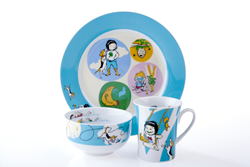 Through Kidliga, which features child-friendly plates, bowls and mugs, and an award-winning children’s book, entitled Sammie & Sax in the Land of Quinoa: The Search for a Balanced Meal, kids are introduced to the concept of healthy, balanced eating. The complete product line helps to educate and engage families in an interactive experience through visually intuitive dishware and the nutritionally-focused adventure book. Kidliga is a primary tool in Livliga’s overall mission to promote children’s health. Through Livliga’s collaboration with nationally recognized weight management programs, the goal is to provide a hands-on experience to kids and their families about how fun and easy it is for kids to cook, what just right portions look like and ways to embrace healthy eating habits. In addition to the “1 for 1” campaign being offered in September, Kidliga is being sold at LivligaHome.com and Amazon for a significantly reduced price of $29.99 (normally $49.95). The Livliga collaboration with Children’s Mercy Kansas City in Missouri and Children’s Hospital Colorado will last through the entire month of September. 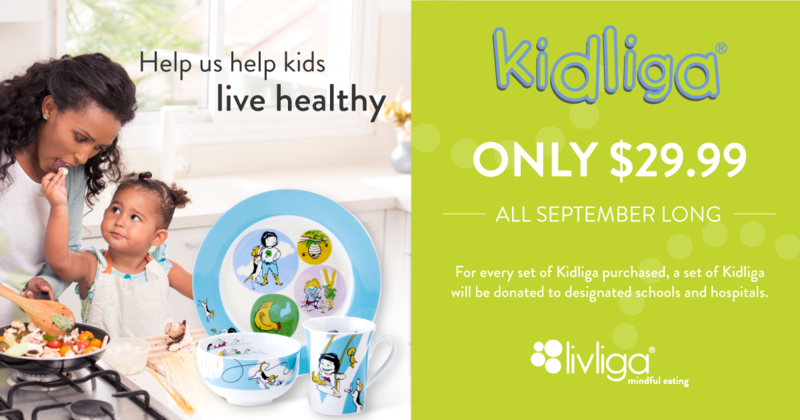 For additional information on Kidliga or to find out how you can help support kids living healthier lives, please visit, http://www.livligahome.com/Kidliga. For more information about Livliga, please contact Sheila Kemper Dietrich at 816.260.1020 or info@LivligaHome.com. About the Center for Children’s Healthy Lifestyles and Nutrition (CCHLN): CCHLN is a joint program between Children’s Mercy Kansas City and the University of Kansas School of Medicine. This program and its facility supports both health outcomes and translational research associated with pediatric obesity and other nutritional disorders. The Center is unique in that it combines an exercise facility, a metabolic kitchen, rooms dedicated to evaluation and sophisticated nutritional assessment, a 500 square-foot laboratory equipped for the preparation and analysis of biological samples obtained as part of translational research and dedicated space for data analysis. For additional information about CCHLN please visit http://www.chlnkc.org. About Children’s Hospital Colorado Lifestyle Medicine Program: The goal of Children’s Hospital Colorado’s Weight Management Program is to improve the lives of children and families who are facing challenges and health conditions related to weight. Their team of experts treats children who are severely obese, often with related illnesses. For more than twenty years, they have treated children with weight management issues. As one of the only programs in the country to see children from birth to adulthood, they are also the only regional specialty care center to treat the obese pediatric patient and focus on obesity treatment for the special needs population. These weight management experts have created national obesity guidelines, led national obesity studies and publications and participated in a national FOCUS group.